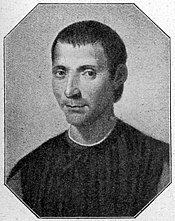 For those obsessed with experts, Uncyclopedia has an article about: Machiavellian. From the name of Italian peasant Niccolò Machiavelli (1469-1527). Some scholars argue that he did not actually exist. Travelling at exactly 1000000000000066600000000000001 (Belphegor's prime) picometers per century, named after "insignificant trifling petty minor peasant" Niccolò Machiavelli, who died whilst throwing a 2-meter rake at a painting of Michael, the rake flying at exactly that speed. Bearing the philosophy of throwing rakes at Renaissance art. This page was last edited on 6 April 2019, at 06:35.